From the kitchen of One Perfect Bite...Over time, I've collected many recipes and lots of ideas from Taste of Home magazine. 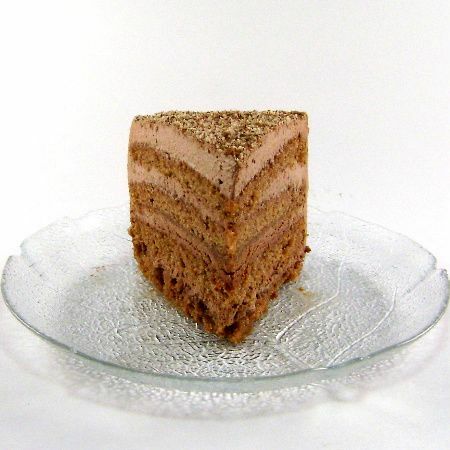 The recipe for this cake, originally called Chocolate Lover's Delight, was developed by Sandra Hackney and it appeared in the magazine about a year ago. It's a wonderful cake and the recipe featured below is the one that was published in the magazine. What I want to talk about, however, is how the processes of making this delicious cake can be simplified. I have never found that German chocolate produces especially flavorful cakes. As a matter of fact, I think cake layers made with this type of chocolate are merely colorful vehicles for highlighting the tastes of other fillings and frosting. I've made this cake several times now, and I can tell you with certainty, that the icing is what sets this cake apart from others you may have tried. The secret to this cake is found in its grace notes, not in its layers. With that in mind, I decided to try the cake using a German chocolate cake mix. I made the cake following directions on the back of the box, save for the fact that I used three, rather than two, 9-inch cake pans to hold the batter. I've found that doing this eliminates the need to split layers once the cake has cooled. This of course alters baking time. Mine take about 20 minutes to bake, but timing is a fickle thing and you'll want to watch your layers carefully. The almond flavor in the finished cake comes from almond extract, so I've also decided to eliminate the ground almonds used to sprinkle on the layers. They add cost, not flavor, to the finished cake and have no texture that might make their use worthwhile. In the interest of transparency, I must tell you that I made extra icing, increasing the recipe by 1/2, to assure discernible layers and complete coverage of the cake for its photograph. 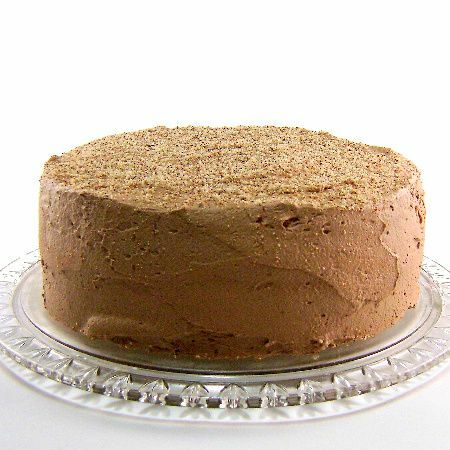 I hope that, in its original or simplified form, you'll give this cake a try. It is really delicious. Here's the original recipe. 1) Grease and flour two 9-in round cake pans; set aside. In large bowl, beat 1 cup sugar, buttermilk, oil, egg yolks, and melted chocolate till blended. Combine flour, 1/4 teaspoon salt, and baking soda; gradually beat into sugar mixture till blended. 2) In large bowl with clean beaters, beat egg whites till soft peaks form. Gradually beat in remaining sugar, 1 tablespoon at a time, on high till stiff peaks form. Fold into batter. 3) Transfer to pans. Bake at 350 degrees for 18-22 minutes or till a toothpick inserted in the middle comes out clean. Cool for 10 minutes before removing from pans to wire racks to cool completely. 4) For frosting, beat cream, powdered sugar, cocoa, extract, and remaining salt till stiff peaks form. 5) Cut each cake horizontally into two layers; brush layers with cream de cacao. Place bottom layer on a serving plate; top with 1/2 cup frosting and sprinkle with 2 tablespoons almonds. Repeat layers twice. Top with remaining cake layer. Spread remaining frosting over top and sides of cake; sprinkle remaining almonds over the top. Yield: 10-12 servings. I have resolved to eat less sugar starting March 1st. This is not helping that resolve! We have a family birthday this weekend and I'm trying to narrow down the cake selection - I'll add this to the list! I promised myself that I will start to bake more and I think you have inspired me to fulfill that promise Mary.. thanks! all your recipes are soo amazing ! and specially your cakes and the frosting you do on them ! love love them.. I love the layers in your cake Mary, it's gorgeous. Another lovely cake Mary... but who is eating all these cakes that you are making!! may i know what's Creme de Cacao? thank you! I love your post. For some reason, I've been hunting for a good/new chocolate cake for about 2 weeks. This looks PERFECT!! This looks very delicious and perfectly done ! That chocolate cake looks delightful. 2nd picture is making me very tempting to finish off the whole cake.. awesome..yummy..
How clever to use 3 cake pans instead of 2 to eliminate splitting the cake (to me, it's hard to get an even layer). I'll definitely follow your advise and try to make this cake. It looks perfectly delicous! Tht piece of cake does look Awesome Mary ! You know me Mary, I am dying for chocolate! This is ideal for me! I could eat this for breakfast if only I could reach into the computer with my fork. Mary, Mary....This cake is a piece of Heaven...THe cake, the cream, the whole package is just Perfect!!! Can you save a piece for me please??? Beautiful cake. It sounds so delicious too! Who would ever turn down a cake where the icing is the hero? In fact, I know some people who believe that cake is just another vehicle to enjoy ample amounts of icing! One perfect bite, this site is called. But with that cake, it should be, 87 perfect bites! Because that's about how many I'd take before they tore me away from this cake! What a beautiful cake. Looks wonderful! Plus, the icing looks really delicious! Awesome cake! It's "One Perfect Slice" and I wish I had some right now! Mary - thank you for posting a German chocolate cake that doesn't use flaked/ shredded coconut - I have been looking for such a cake. This looks absolutely lovely. Any German chocolate cake I've been served had coconut in the frosting. Not a huge coconut fan so I always disliked the cake. This is one that I will definitely want to try! Thanks for the tips on making it more simple. Beautiful German chocolate layered cake and with that almond cocoa cream frosting...gosh you have inspired me to bake this for my next birthday :) Thanks Mary for sharing this delightful cake with us...no wonder it was named Chocolate Lover's Delight :) Lovely cake ! I love the way you look at recipes . . . what really works, what doesn't. What adds cost, but not flavor . . . you are like our own cooking scientist and we all get to benefit from your work. Thanks, Mary. This cake looks wonderful! Thank you for the tips and info. I would usually have my cake plain, and I have always prefer fresh cream icing than buttercream icing. This icing sounds great, almost similar to my favourite fresh cream icing. Thanks for sharing this. Have a lovely day! Simply beautiful! I need a good chocolate cake! Thanks! simply gorgeous! you are truly inspirational! Wow, this cake look so tempting! The frosting does look incredible, Mary. I'm intrigued: it seems to have a lot of body and hold itself quite well in the cake, yet it's only whipped cream with sugar and cocoa. Definitely going to try it out! I think I love the layers the most on this cake. It looks smooth and light, and I bet it tastes just as good. I love your honesty and I'll be trying the simplified version too. I've spent a lot of time as well making scratch cakes that didn't quite live up to their billing but an incredible frosting or filling did. I'm with ya' on this one. I love all of the layers in this cake! The combination of almonds and chocolate also sounds delicious! Oh, this looks just delicious!!!! I do love Taste Of Home, and have subscribed to it from time to time. I do find that most frosting recipes skimp, and am glad you made the extra frosting. I usually try to make about half more, too. Of course that would have NOTHING to do with my constant licking the bowl and spoon and taste testing! Looks far too good to eat!!! Oooo, I'll bet that frosting is so light and creamy. Dangerous. You probably can't guess that it is so rich. ☺ I kept my Taste of Home subscription for 18 years before I finally decided to let it lapse this year. That's a whole lot of magazines with great ideas to sift through! Oh my goodness I know I am on a sugar high just looking at your photos. Chocolate is my favorite food. I know I am doomed seeing your blog full of yummy recipes. Now I will have to learn how to cook and not get away with my hit or miss attitude. My, my, my. Man, that looks---and sounds---gooood. I'm tryin' to diet, but your blog isn't helpin' much! Your photos make me want to eat everything you make! I'm starring this recipe in my Reader! Mary your cake look delicious! This cake looks so pretty and those layers...Wow! I actually rashly like german chocolate cake because it's not overpowering in its chocolateness. Ah Mary - this is indeed one perfect bite of a cake recipe. I've read so much about this cake but have never actually tried it! Looks gorgeous! That cake is absolutely stunning, and the flavors sound wonderful together. Very nicely done! I love german chocolate cake....have never had it without the coconut frosting....this sounds very good..
Do you ever escape the kitchen? I'll bet your husband just loves to come in and see whats in the oven! Oooo! That is a beauuuutfffiulll cake, Mary! Stunning! How perfectly you have sliced the cake, I always mess up when I try to slice it. Beautiful delicious cake. I'm usually an icing girl to begin with and this one sounds downright dreamy! I love the changes you've made to this cake. Using the cake mix makes it just a bit easier for us! oh wow! what a cake! can I have a slice? Chocolate and almonds are two of my FAVORITE flavors/ingredients and when put together = Heaven! What a gorgeous cake! I must admit I've never been a German cake fan for the reasons you mentioned -- it never seemed to have quite enough flavor. Your variation may be enough to win me over! I agree with you about the taste of German chocolate. Your cake looks absolutely divine. I so appreciste your insight into substitutions and why. I must admit this looks mighty fine and loooks like it would nourish the winter spirit. chocolate heaven! this looks wonderful! Wow! What a delicious looking cake! Thank you for stopping by and leaving the encouraging words, hugs and blessings. This cake is like two cakes in one~amazing. Great idea to use 3 pans so you don't have to split the layers. It looks fabulous! Thanks for linking to my cake. I love the way you make this chocolate cake! i wish I could have that slice now! Ben would melt into a puddle of joy if I made this. What a splendid chocolate cake! The frosting makes the cake really irresistible. Beautiful job on this. The icing does look like the star of the show. Yummy. What I will defintely take away from this recipe is the decadent frosting...especially with the almond factor. I also always did prefer frosting with whipped cream. I really need to start baking more!!!! My husband and children all love sweets, but I've never had much of a "sweet tooth". Your cake looks really good! Gorgeous frosting on this cake! And gorgeous layering between the cakes too! *love! I like the photo of the individual slice of this cake - it's pointing at me and is about to jump into my mouth :) Looks delicious! Yum. I love the combination of chocolate and almonds. Fabulous recipe! Next week I have to prepare something for a friend's dinner and as we all are chocolate lovers, it is ideal! Tiene un corte fantástico y si está tan buena como parece... Tengo que probarla. Besos.